Noted this is a thing that is happening all over the world, take their money but don't give proper care..thanks Agnes! This news is not surprising for anyone who lives with the NHS. It was initiated without taking into account that people would live longer because of it, more illnesses would be cured, population increase, increased wages bills etc., so care would be compromised. Unfortunately, it's true that you do get what you pay for. This is a common problem in Hospitals and it's disgusting and reprehensible! You have to stay with your loved one, when they are in Hospital, just too MAKE SURE they get their pain meds! Noted and thanks for posting Agnes! I have experienced exactly this with my mother recently. How horrible! We have lost all sense of the sacredness of life. I have seen levels of incompetence here also in the states, and the lack of compassion with staff. The abruptness and rudeness is disheartening to say the least for our loved ones who are hospitalized, and the attention, or LACK of care that is so common today. Like Jerry said, we're a number, and give us the $$ and they don't care. William, I hope your mother will be all right. This is no way to treat our elderly!!! Thank you, Agnes for this sad story. What a shame. It's horrifying. There is no respect for the elders anymore. I don't want to get old, or sick at any age. I thought it was upsetting enough for how they often treat your everyday people and situations, but our seniors deserve more respect than this. :( If a petition comes up, I hope to be able to find it quickly! Thanks Agnes .This is a scathing indictment of your hospital system.and the urgent need for government run universal medicare system that is well funded by a fair taxation system.The more you earn the more you contribute for the welfare of all. I've seen this first-hand. Patients need at least one advocate who's prepared to get stroppy on their behalf. I must also say that I've seen some tremendous care in NHS hospitals too. This has to be stopped! Think of ending one's days like this!!!!!! Horrible! Where is the ethics! Sadly, this article can be written about medical malpractices in the US. This has nothing to do with socialized medicine. It has to do with incompetence, and being under staffed. Hopefully something can be done. Noted. Somebody please ask one of the Rethugnican candidates for president about this subject. They probably have no clue about the situation. **** There is medical malpractice happening everywhere, every day. Not all of it is intentionally malicious. I am sure that this is happening in many hospitals and Long Term Care Facilities. However, in defense of nurses (I am one), there are good nurses, hospitals, etc. One facility where I was working, the State surveyors arrived for their yearly inspection. I was asked for 3 charts, a new admission, a diabetic and a decubitus (bed sore). She became very irate when I told her that we had no decubiti. She would not believe me and actually slammed her fist on the desk. I then had to call upon the Director of Nursing to back me up. It would be my hope that all the elderly could have good care and die with dignity. It disgusts me to think that someone claiming the title of "nurse" would treat any patient so badly. I hope that those involved in the reported cases are stripped of their licenses and never allowed to work with patients again. This is despicable. How can any human treat people like this, much less nurses? We can thank corporate power and their republican agents for this. noted. It is horrible how the elderly are treated, I don't understand how people can be so heartless. Have you ever thought of why you have a headake after an operation or you hurt somewhere else that you didn't hurt before the operation? Elderly Abuse is a No No here in my city where I live. But it does happen. This isn't only in hospitals. It's also in homecare and hospic care that their abused as well. 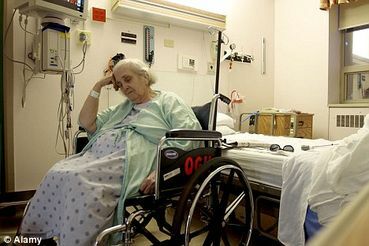 Elderly people are seen as a drain on the health systems,and are also seen as non contributors to society.Their value starts to diminish when they no longer work.Once a person becomes frail and reliant on any kind of care,the door is open to abuse and neglect. It is a sad state of affairs in our time that this happens.I am afraid ,with the worlds ageing population,we will see more ,not less of age abuse.These are not my opinions,but fact and are drawn from years of working for and with disavantaged persons. This is very sad. I wish that all staff really did care. It is outrageous; alas, it happens. Unfortunately, many people are not allowed to die with dignity, which is one of the saddest things in the world. Even in countries where people pay their health insurance all their lives they are deprived of due care when sick or old, which is very unjust. As if the hospital environment was not depressing enough... It must be terrible to die alone in a hospital marred with neglect and indifference. It is very sad when a person becomes old and dependent on others, and everybody certainly wishes to be spared this. Even if the person is lucky enough to have a loving and caring family, a professional medical attention may be inevitable... I have always thought that, if one is going to die, it is always better to die before ever getting to hospital, to die at home, in a loving family. Even if a hospital is understuffed or underfinanced, it is its duty to fix this and provide people with what they deserve. There is an urgent need for more humaneness, which is seriously lacking in this world. This abuse on the elderly needs to stop, they should not be treated like this. It is a SHAME that people have to live there last days like this. Hospital's and nursing homes just want to get there hands on there money, that's all they care about. If a family member is not around to check on them, they are treated horrible. Not all places do this, but a lot do. That's why we have places for the elderly to stay when the family can't take care of them anymore. They should be treated with respect and dignity. Noted. Is there some way to help the situation improve? It says that Nurses have refused to give painkillers to dying patients, just wait till its their turn no one will care about them, because everyone is heading in the same way!! I have spent enough time in hospitals to know you have to be DILIGENT. If there are any questions about care, you have to go to the doctor. If the doctor is unwilling to help, get another doctor. Check all medications that come to the patient to be sure they're getting the right ones. BE THERE with your loved one, or have another family member or close friend BE THERE. I never expect the nurses to give the care I would, so always find someone on staff who can help me find what the patient needs, or who will get it for them. Sadly, you cannot leave your loved one by themselves unless you know the staff personally and/or know they will take care of their patient. It's a terrible tragedy that our elderly are not respected and reverred as they should be. Thanks for a good article, Agnes. Terrible,just terrible.I pray to God I don't end up like this when I get old(er)hopefully,I'll go to my own bed at home and die peacefully in my warm bed a very old man.No nursing home for me!!! It was only a matter of time before human beings start to be treated the way animals are treated. We need to have respect for all life. And who in the world would hurt someone elderly? I mean come on. We are not alone on this planet because those people are aliens. Everyone should be treated with dignity and compassion! It's not rocket science to work out which patients can and can't reach their food or need to be cleaned up! We all aim to live a long life, so it's likely that at some point we will all need this care! This is a shame. Where's the love and compassion ? Out of work out of dignity ? The elderly should be treated with love and respect. Nothing new here, because everything depends upon the quality of the hospital and also upon the ethics and quality of the hospital personnel, or also in how much money one has! I remember sitting in a business class once, where a business textbook described "older widows as fearful recluses and classified them as losers" the book further warned the business student to stay away from them as a demographic sales market. I remember getting real angry after I read that, and it made me realize one thing. That one thing is this, that in reality that is the way of the dark,wicked, and unjust world we live in! That is so sick that people dare treat the elderly so. What if it was their family members? I guess they wouldn't care for them either. Or they would have them in such expensive homes where they would get the best treatment. So that is such discrimination against the elderly who were our past, our parents, grandparents, aunt's and uncle's. Where is the line GOING to be drawn on elderly abuse? ?